The dark form glided towards my daughter’s bedroom. Frozen, I watched while it silently lifted her out of her bed and flew back down the stairs, just as she woke up and began to scream for me. That’s about the time I’d wake up yelling from this reoccurring nightmare. Disoriented, I’d bolt from bed and arrive panicked in her bedroom to confirm her sleeping, untouched form. This happened numerous times during my daughter’s early years until I took a combative stance against fear. I fretted about many things concerning our sweet girl. The first few fevers she spiked, we rushed to the ER. We insisted that she be tested for deafness before we accepted that God gifted us with a peaceful baby. I took flues and colds personally and feared they masked something worse. I think the nurses at her pediatrician’s office privately rolled their eyes, every time we came in with our latest mini-drama. I don’t know if I became so fearful because we waited seven years before she arrived, or because she is our only child, or because of my own overactive imagination. Most likely, my fears came from all three, and I let them run loose. One morning, after another rough night, I cried out to God to help me to change. Sadly, by this time, our daughter experienced nightmares of her own and wound up creeping into our bedroom each night to sleep on the floor. In that moment of calling out to God for a frightened momma and child, he led me to passages in Isaiah that speak of how tenderly Christ cares for us, like a shepherd with sheep, especially chapter 40, verse 11. The word picture created by the prophet struck a chord in my troubled soul. I recognized that I followed fear more than I followed my shepherd. A book I read entitled, “Hinds Feet on High Places,” by Hannah Hurnaard came to mind The beautiful allegory features a main character named “Much Afraid,” who longs to leap about on the high places with the Good Shepherd (Habakkuk 3:19) but instead lives a small, fearful life until the day she decides she will wholeheartedly trust God to care for her. My approach to mothering needed to make a dramatic shift. I helicoptered before that parenting style earned a name, and I knew it needed to stop. God washed and renewed my mind and heart with His Word about who he is and who I am in him. As I battled to demolish this stronghold, God used a simple charcoal drawing by an artist to help me understand his loving care for his sheep. The sketch represents Isaiah’s shepherd motif wonderfully. Parents, our children belong to God, whether we affirm or not. Our young children are his creations. He cares for them more profoundly than our earth-bound brains can comprehend. He assigns angels to watch over them and covers them with his own mighty hand. The gift of the Holy Spirit inside of us makes us sensitive and able to hear his specific, unique directions for each of our children. We are given the privilege of helping to shape their characters. In his perfectness, God even uses our flaws to develop godly traits in our offspring. I’m positive that part of my daughter’s patience and grace with some of her more, shall we say, “artistic,” children come from the lessons she learned living with an unpredictable creative for a momma. The truths I learned about Jesus’s relationship to my daughter demolished my parental fears. Once I understood that my role in raising my daughter was administrative assistant, not CEO, the atmosphere changed in our home. Overprotective, overreactive, helicoptering parents, please ask God to help you get ahead of this. You must choose whether you will allow fear or Jesus Christ to rule over your parenting. That decision alone will affect the entire dynamic of your household. It’s that simple to say and takes lots of faith to do in this dark world in which we live. We framed the charcoal print and hung it, so our daughter could easily see it from her bed. Through Scripture memory and prayer, she internalized truths about God’s faithfulness and goodness and continued to learn from our examples. Did she and I still have scary dreams occasionally? Absolutely, but they became exceptions instead of the rule. Remember, King David said, in Psalm 23, “though I walk through the valley of the shadow of death, I will fear no evil….” In this life, our families will need to face evil circumstances and walk through them. Our job is to teach our children, by example, that regardless of what invades our lives, Jesus’ role as our compassionate, unflappable shepherd remains constant. We can remain at peace, in his arms. 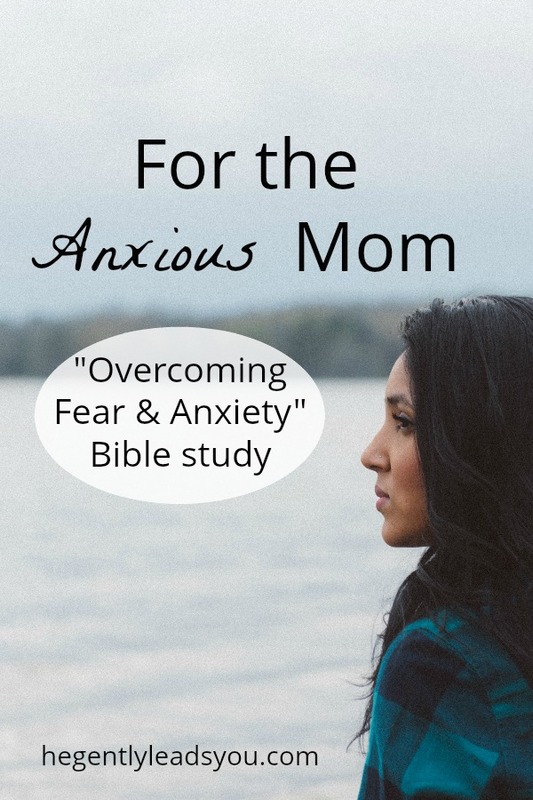 Download the FREE, 3-Week Bible study. Click on the picture to go to the Library of Downloads page.